Kathleen, THANK YOU so much for posting this very informative and timely information. I obtained a copy of one of my brick wall ancestor's death certificates and discovered that he died as a patient at the Austin State Hospital in January 1952. The cause of death on his death certificate is very interesting. And with that info along with what some family members have shared, I would really like to learn more about his stay at this facility if possible. You article gives me some places to definitely start and explore more. Again, thank you! 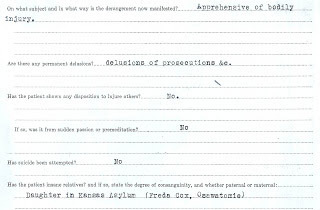 Kathleen - I can't find any collections for the U.S. on FamilySearch.org that contain the words insane or asylum. I also looked at the list of Louisiana records there and don't see "New Orleans (Louisiana). Insane Asylum, Records of the Insane Asylum, 1858-1884". Do you think they removed this collection? To get this result, I put asylum in the Catalog keyword search. If you go half way down the page, you will see Records of the insane asylum, 1858-1884, New Orelans, LA. Kathleen, I didn't even know any of these records were available. I had a maiden aunt who was institutionalized, very sad, and her sister, another maiden aunt, kept all the papers, so I just saved some of them, figuring there would be no "records," ever. The doctors apparently were not able to allay her anxiety and distress. This was back in the mid-20th century. It's good to know that some records exist -- thanks. Thanks Jana for including this post in your weekly review. Very interesting and informative blog and about the doctor’s medical cause of death certificate. I must appreciate your work well done keep it up.